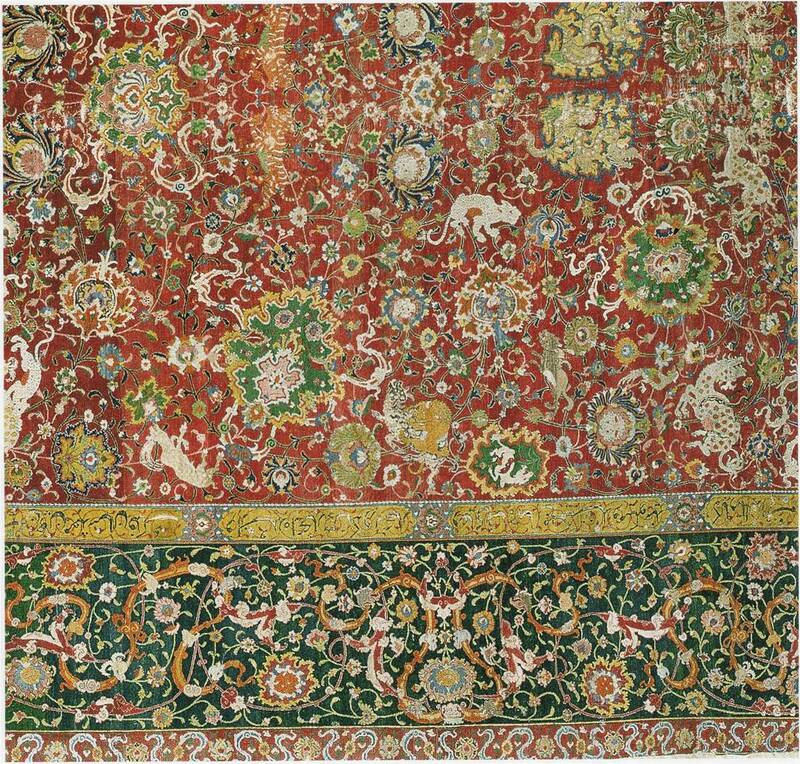 The carpets of this well-known Persian group dating back to the 16th century have patterns with flowers, cloud bands and animals on a background of spiral vines. Their place of origin has not been finally clarified. The towns Herat, Isfahan and Kashan may be possible. Documents offering definite proof, however, are missing. 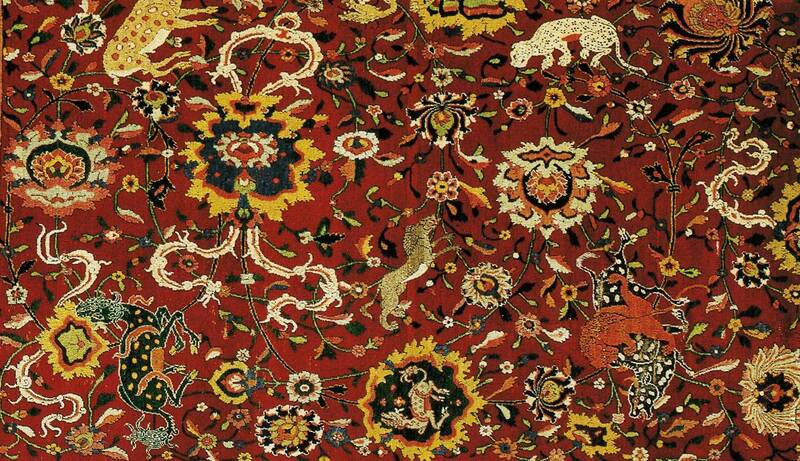 Only three of these carpets, which are known, survived in full size. 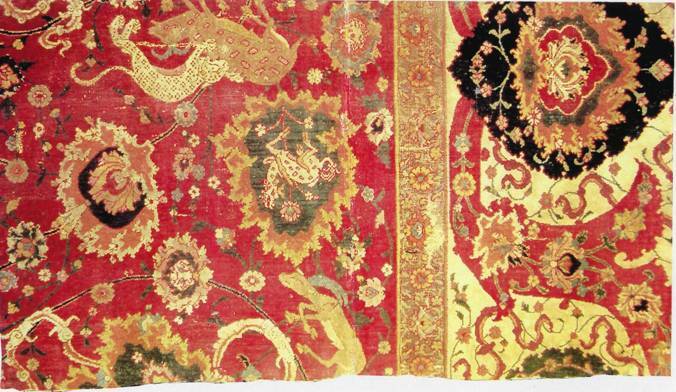 Two of them are the famous so-called "Emperor carpets" forming a pair. They both were formerly in the Habsburg collection. Nowadays they are kept in the Vienna Museum für angewandte Kunst (Fig.2 and 3), and in the New York Metropolitan Museum . The third one also is in the Vienna Museum (Fig.4), unfortunately in a very bad condition. There are further eighteen fragments, belonging to the group, widely distributed in many collections. 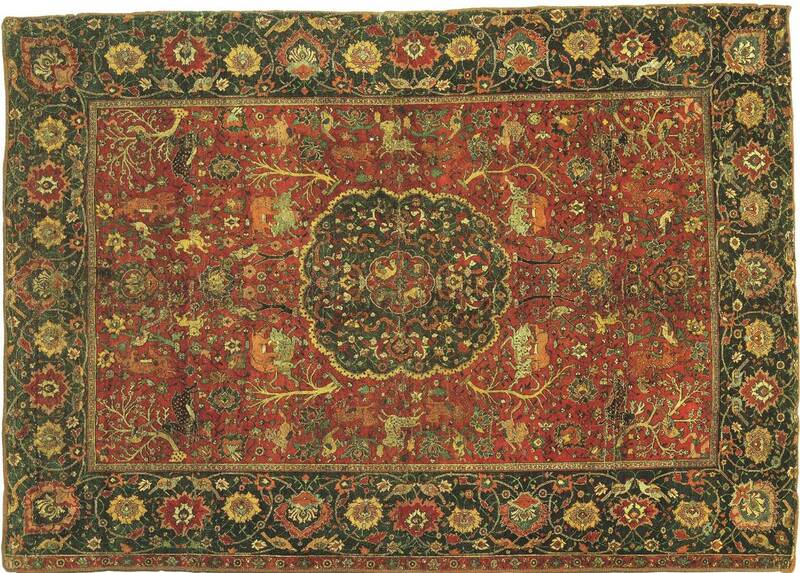 Regrettably, the classical carpets were never documented, before they were cut into pieces. I will arrange all preserved pieces in pattern groups, further describe how the fragments originally fitted together, and give their positions on their original carpets. As far as possible, I will reproduce the original images of these carpets. call A1, A2, B, C, D. The two A-cartoons are in itself very similar. First of all I will describe the common features: The patterns are mirror-imaged in all essential details along the vertical and horizontal axis. Thus one quarter is quadrupled by two-fold mirroring The field has a red background. [Fig.5] reproduces the scheme of one quarter of the field with the most important motifs. The field is arranged in two spiral vine systems of different colours, positioned on two levels one above the other. The system on the upper level, in blue on the sketch, includes in the vertical direction three connected spirals for each quarter of the field. The two spiral systems are shifted against each other by half a spiral in a parallel way and in a vertical direction. Detecting the spirals is more difficult (see fig.1), because they are overlaid by many different motifs, especially flowers of various sizes. Between them long cloud bands are winding, partly covered by the flowers. Many animals and beings from Chinese mythology are standing in various directions. We see single animals, and some in combat with a predatory cat. These are not hunting scenes, no humans are involved! A few beasts are integrated into flowers, some flowers bear mask-like lion faces (see fig.2). The borders consist of a relatively wide main border, and of a narrow inner and outer border respectively, which usually have different patterns. The corner solutions are always perfect. The border pattern is not uniform. Three border types have been preserved, which I will show in the corresponding cartoons. The format of all carpets is elongate; the length is more than twice the width; the largest carpets are about seven and a half by three and a half m in size. The borders are broad (as already mentioned). A common structural feature is - in addition to the use of wool for the asymmetrical knots open to the left - the exclusive use of silk for the warp. There are always three wefts between each row of knots. The warps are achieved in two levels. The materials used for the wefts are not uniform. 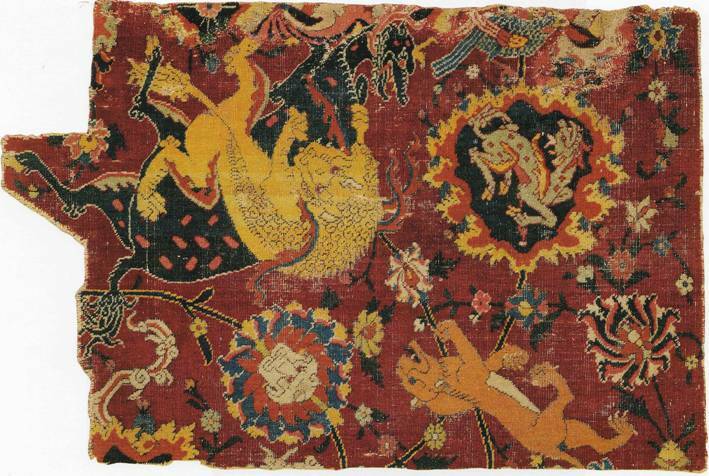 The carpets of both cartoons A1 and A2 have three wefts made from silk. For the other carpets, the outer wefts are made of wool, while the centre weft is of cotton. The knot density varies between over five thousand and over three thousand knots per square decimetre. The number of colours is large, between twelve and eighteen. Now I will discuss the five cartoons for the ten carpets in some detail. These carpets are the largest and have the finest drawing. No motif is cut at edges. The dark green main border with its cloud bands and spiral vines is impressive due to its particularly rich drawing. The inner border bears yellow inscription cartouches, barely readable, among others includes praise of the Shah. 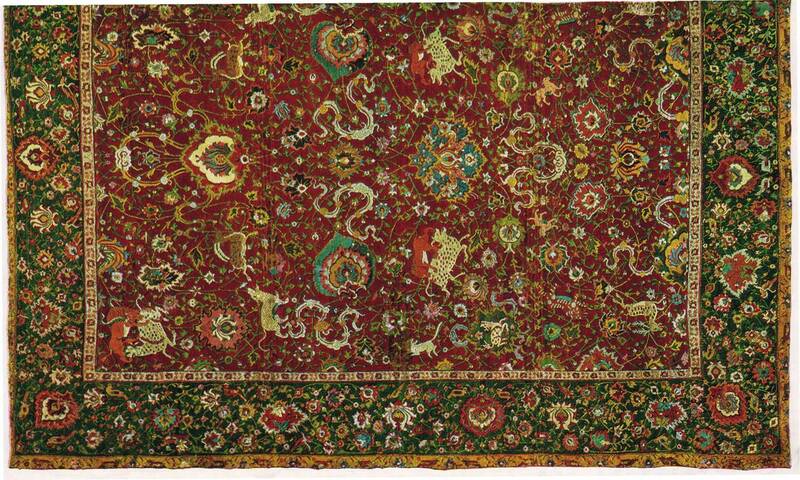 This lets us think, that these two carpets were made for the Shah. The outer border with the red background shows cloud bands above a vine decorated with flowers. Carpet III in Vienna is complete in size (see Fig.4). Fortunately we know what cartoon A2 looks like because of this complete carpet. That’s of highest importance for the reconstruction of four other carpets. 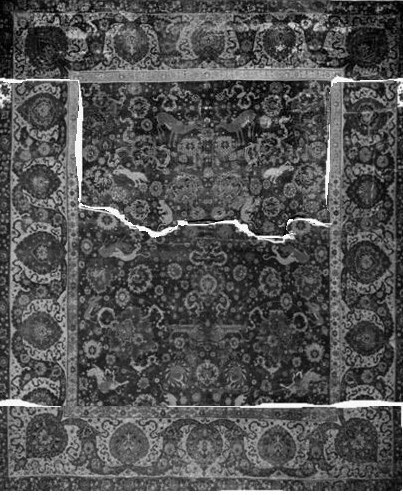 Due to the similarity with the emperor carpets and to the design symmetry we can be certain that the severely damaged carpet III is actually preserved in its full size, and it is theoretically possible to complete its missing sections. Slight differences in the motifs of the cartoons in the fields of A1 and A2 are to be seen only in a few animals. Using Carpet III as a basis, twelve fragments can be positioned on four further Carpets (IV-VII) with only a few inaccuracies. Carpet IV is a counterpart to carpet III. On the reconstruction drawing [Fig.7]. I marked the positions of the surviving five fragments. 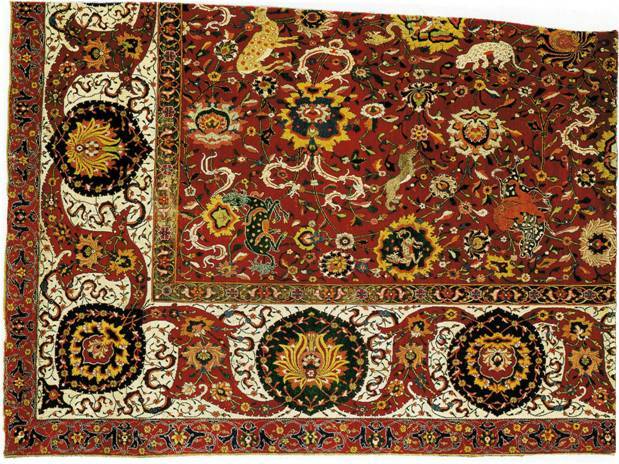 The largest and most impressive piece, called Tabibnia carpet (violet in the drawing, full picture in [Fig.8]) came via Moshe Tabibnia in Milan into the Islamic Art Museum in Dohar in Qatar. It formerly was in the Textile Gallery in London. 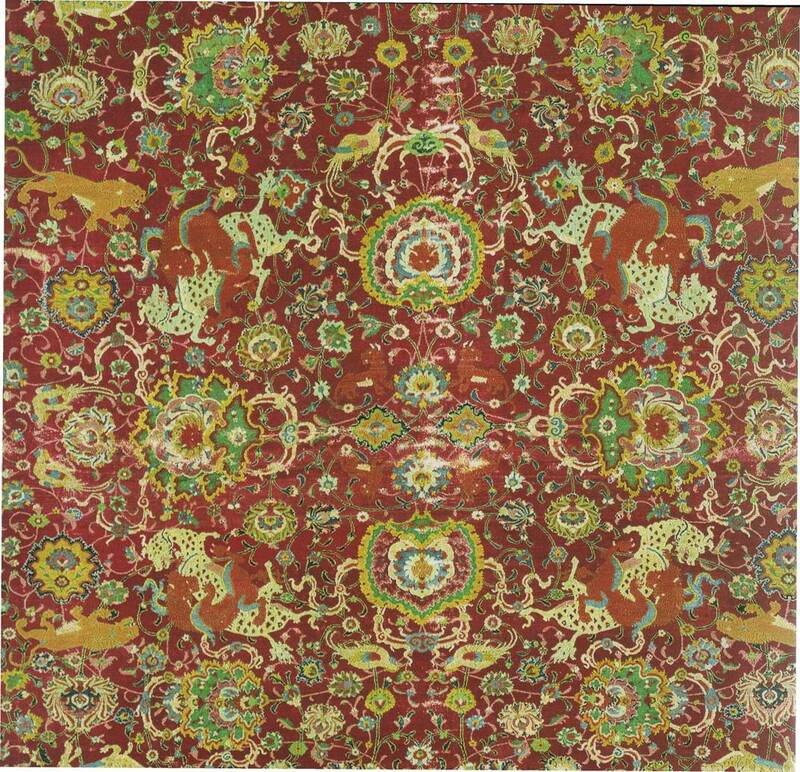 In his discussion of this piece, Michael Franses has named it the most important spiral vine carpet with animals. The field of the Tabibnia fragment is preserved in the complete original width but not in length. It is sewn together from the original upper and lower sections. The original middle section is missing. The seam passes along an irregular arch. The lower part of the left border has been acquired 1996 from Sotheby’s and put in place. The rest of the left border is rewoven. 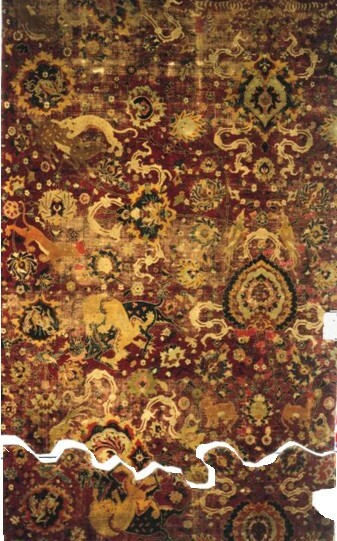 However, there exist further parts of the original carpet IV, which fit into the space left from the Tabibnia carpet (brown, red and orange in the drawing. Some border parts (brown) are preserved in the Textile Museum, Washington D.C. and a US private collection. The inner border is the same as on carpet III and the following carpet V. We may assume that the outer border too was the same as on these two carpets. Two more fragments were originally in lower half of the carpet (here therefore upside down), the small border-free piece from Copenhagen, David Collection ( [Fig.9] red in [Fig.8] ), and the mirror-imaged piece from Torino, Museo Civico ( [Fig.10]); orange in [Fig.8] )with inner and main border. Carpet V is a second counterpart to carpet III. The reconstruction drawing [Fig.11] shows eight fragments as sections of this second counterpart of carpet III. In red colour we see different parts of the carpet in the Victoria and Albert Museum. 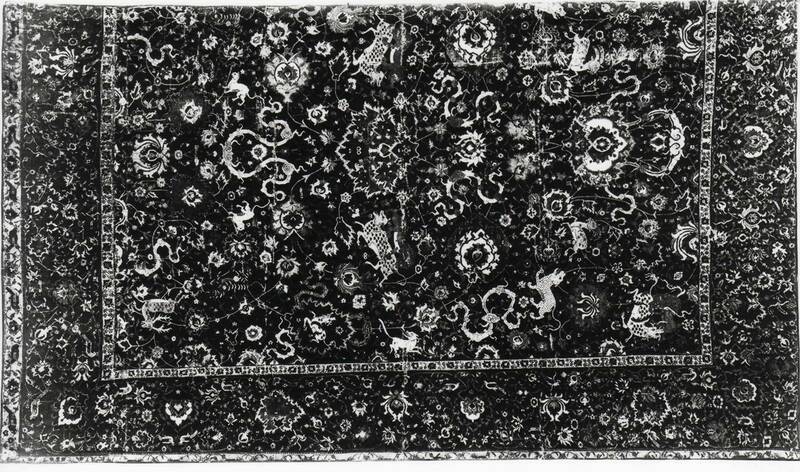 It is sewn together from at least 3 larger parts of carpet V [Fig.12]. Fortunately, the whole width is preserved. 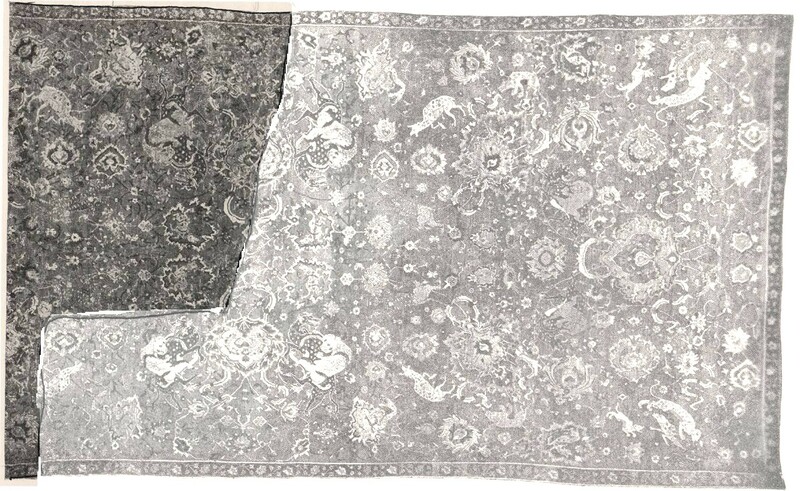 A carpet from the Edward James Foundation in Chichester, sewn together from two fragments ( [Fig.13]), blue in [Fig.11] has on its right side to ‘key-holes’, for which the ‘keys’ come with the Yerkes fragment (green [Fig.14, 15]) and with the Paris-fragment of the MAD (yellow [Fig.16]) respectively This is an additional proof that the three pieces from Paris, Yerkes Collection and Chichester belong together [Fig.17]. The best known fragment is the Vienna corner piece (green [Fig.19]). The second fragment is the almost complete lower right field quarter from Liberec, formerly Reichenberg, a town in northern Czechia (blue [Fig.20]). They show that carpet VI had different guard stripes than carpets III-V. Both stripes show a vine decorated with arabesques, the outer one somewhat more elegant. On the left vertical side of the Liberec piece the inner border was sewn incorrectly on the central axis and not on the edge of the field, where it once was. A small border-free fragment of cartoon A2 ([Fig.21])is in the V&A Museum. It must come from a further Carpet VII; since it cannot be attributed to any other carpet, discussed so far. Cartoon B was used for Carpet VIII, which is similar to Cartoon A. 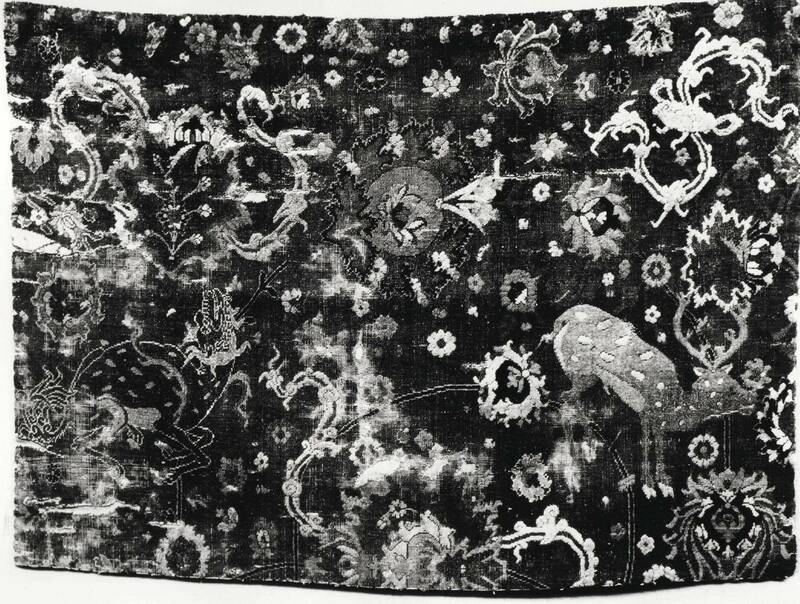 One of the two fragments preserved from this carpet are kept in the Washington Textile Museum. Only the small, here white outlined part of the Washington carpet is authentic from the 16th century. The whole other areas were rewoven. The original part was published already 1912 by Sarre and Martin as a single fragment in the Bernheimer collection. In the exhibition catalogue, Chicago 1926, Pope published a large section of an apparently complete carpet, including a part of the Bernheimer fragment, here on the left hand side. I have outlined it in black. The fragment is cut off on the edge of the catalogue picture. The light grey area is rewoven. The large carpet in the Chicago exhibition was the Washington piece. The Bernheimer fragment contains the two axes, only a short span of the vertical axis is missing. So it is possible, using mirror-image symmetry, to fit the fragment into a large and apparently complete carpet. This "reconstruction" took place after a change of owners between 1912 and 1926. The Chicago catalogue gives no notice to this addition. The reweaving follows the drawing closely, but with symmetrical, not asymmetrical knots and not using satisfactory colours everywhere, and of course not to the original full length. The main and outer borders are missing. 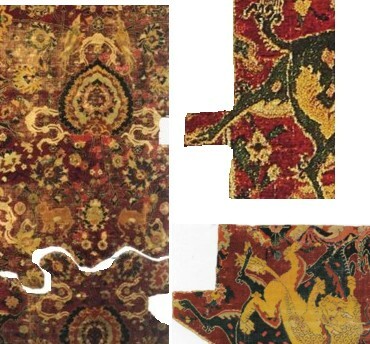 The two large fragments from the Hamburg Museum für Kunst und Gewerbe [Fig.26] and from a private collection [Fig.27] belong to this carpet. The carpet was divided along the horizontal axis into the two parts. Along the cut, parts of the right hand vertical border were sewn on the both fragments as horizontal borders. The reconstruction [Fig. 25] is easy to carry out using mirror imaging. The flowers on the field edges are halved by the borders here - in contrast to the cartoons A and B - and all large flowers are parallel to the axes. No birds are found in the field, except one pair on a large flower, neither are masks on flowers. The green main border shows between a vine with many flowers numerous birds, sitting and flying, alone and in pairs. The yellow outer border likewise depicts birds. Two fragments have remained from this carpet. The mirror-imaged sections are kept in Paris, here marked with a light blue line, and in London, on the picture the coloured part. It’s the last piece (no. 21). 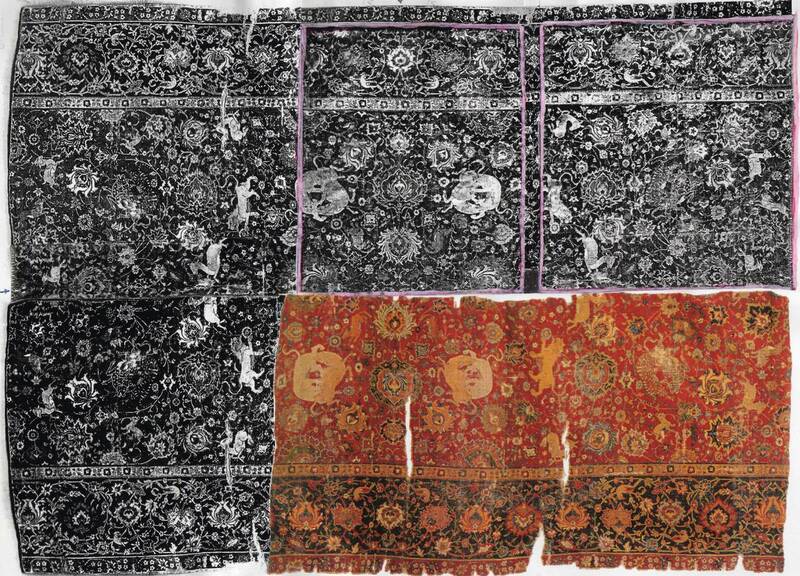 Since the two surviving parts contain the two axes and the borders, it is possible to reconstruct the carpet to its full width of over 2 m and to a length of about 3 m by double mirror-imaging, how the picture shows. We may assume that about half a metre is missing on each field end. The Paris piece is sewn together from two parts; the picture shows the seam run. But only a very narrow stripe is missing, as can be clearly seen from the mirror-imaged London piece. The flowers at the field edges are halved. The very precisely drawn animals stand out boldly from the design, and some are of a different kind from those on the other cartoons. No birds are to be seen on the field areas preserved, neither flowers with overlaid animals or masks. The absence of cloud bands is noteworthy. The main border is related to the one on carpet IX of cartoon C. Similar bird borders also occur on other carpet groups. Let me briefly deal with parallel and further developments of the spiral vine carpets. 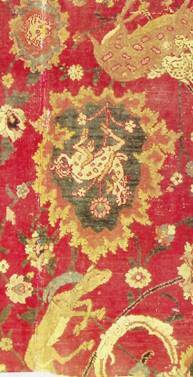 One type of these carpets has a close affinity with the spiral vine carpets with animals. Most of these examples bear a centre medallion. The spirals are reduced to short vines, the animals are numerous, the flowers retreat in favour of trees, and cloud bands are usually missing. 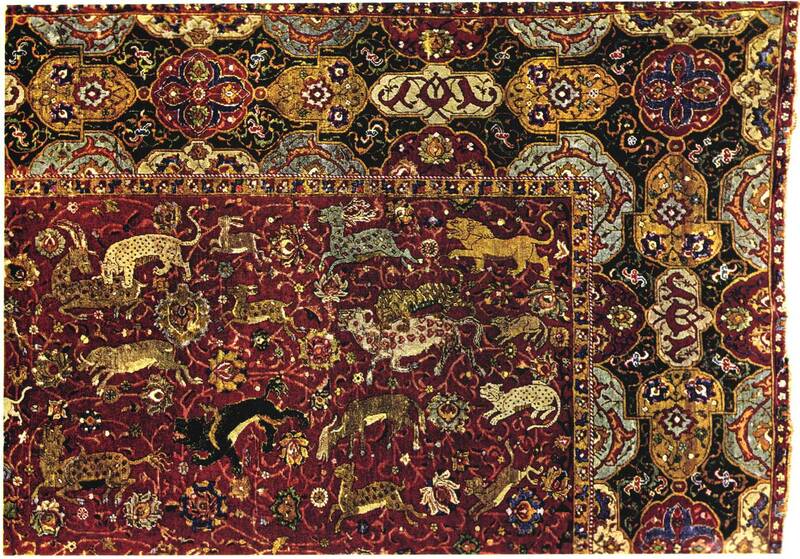 All these carpets with animal representations belong to the tradition which was cultivated in many Persian weaving centres in the 16th and 17th centuries, where a fruitful exchange of ideas and know-how took place amongst the workshops. The second line shows a development towards avoiding animals, right up to their complete disappearance, while the floral pattern with double symmetrically arranged flowers and cloud bands was retained. This went over an intermediate stage, where only birds are strewn into the basic pattern. 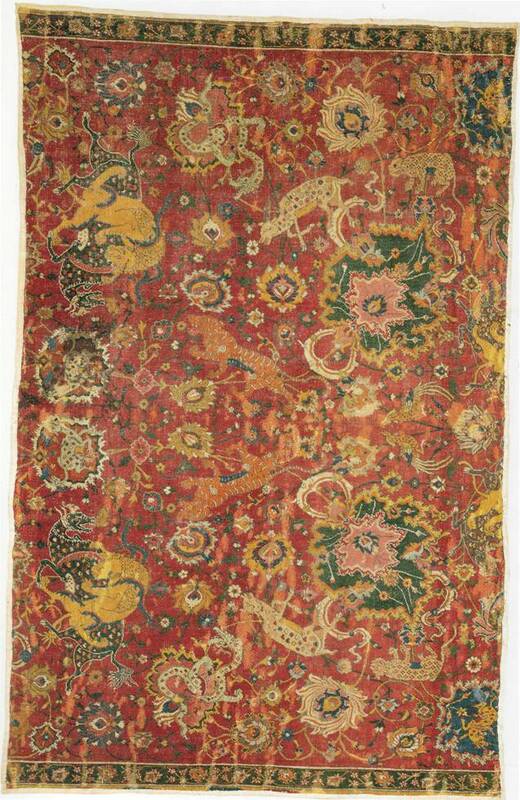 The spiral vine carpets without animals on a cotton foundation were produced in great numbers right into the 18th century. Putting together all pieces existing, the description of their common features, and determining to which original carpets the many fragments belonged, makes it for the first time possible, to survey the previously considerably disordered material. I could show that the twenty-two preserved pieces belong to ten spiral vine carpets with animals, of which seven are woven according to cartoon A. The other three carpets are each produced using a different cartoon. 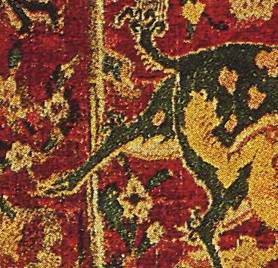 The preservation of carpets is certainly subject to many coincidences; but it seems very probable that the design of cartoon A was, amongst the spiral vine carpets with animals, the one, which was actually used most frequently. 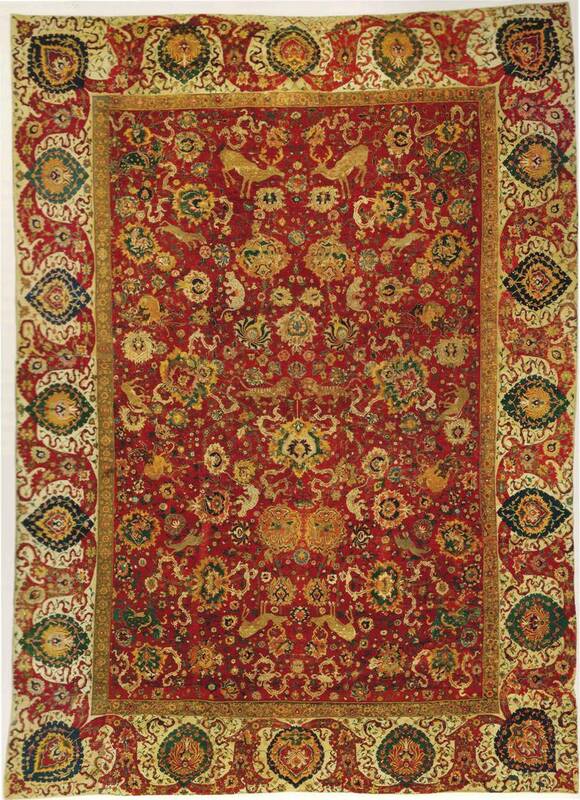 The magnificent emperor carpets, which were woven for the Shah, judging by the inscription, obviously had an ideal model function.